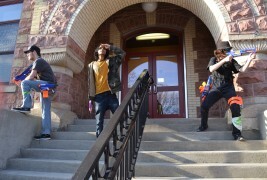 Humans versus Zombies (or HvZ as it is more popularly known) is an educational experience. It forces students to figure out how just long they could survive in a zombie acolopyses, armed with nothing more than nerf guns and socks for protection while jumping from one safe zone to another. But the undead aren’t the only threat they face. Hidden amongst their mids was Patient Zero, or PZ – a traitor to the human cause dedicated to tag and turn humans from the inside! Each HvZ game is different from the last, but it all started with its pioneer in DSU, Professor Berman. “Glenn Berman and a team of students at DSU around 2009 started the game. Since, there has been at least one game run every semester, though the tradition has been one weekend game and a two week game, much like what we’re running this semester. Every game has been different of course, as some people remember our winter game and reverse game that was run in the previous years. We’ve also implemented new features like the shop system and every semester, we’ve tried to bring new missions (or modified versions of older missions) to the table in order to give players the best game we can,” said one of the admins “We’ll be bringing the shop system back for the two week game this semester but with a whole new inventory and different currency then what players have previously had to look for,” Laura Bieber commented about updating the shop system. The 2-week game had five admins this time – Jesse Parkison, Ryan Johnson, Laura Bieber, Len Mutzenburger and Zene Huber. Cody Putzier, another admin stepped down this semester to take a more advisory role as he graduates in May and wanted to play his last semester, the admins revealed. Feed the Madness: A Novice's Perspective of March Madness.